Plantation shutters have earned a reputation of being the best window treatment to increase the value of a home. But beyond its ability to increase your home’s worth, is the installation of plantation shutters in your Sydney house a sensible decision altogether? Let’s find out! Plantation shutters provide excellent insulation for all seasons. During winter, plantation shutters are efficient in keeping the warmth inside, thus ensuring comfort for you and your loved ones. On the other hand, in summer, timber plantation shutters can easily be regulated to let cold air and wind inside, thus reducing your need for air conditioning. How much do plantation shutters cost in Australia? The price of plantation shutters in Australia typically ranges between $1,000 and $2,000 for a standard window measuring 1,200mm width by 2,100mm. The exact pricing on plantation shutters will depend on the finish, style, and material used. The most common materials used in the production of plantation shutters are timber, aluminum, and PVC to name a few. The cost of DIY plantation shutter installation is much cheaper since you do not have to pay for professional installation fees. With the long-lasting quality of plantation shutters and the significant value that they add to the value of your residential property, they are definitely worth the investment. 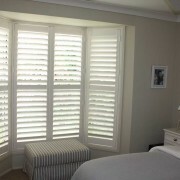 To learn more about plantation shutters or if you wish to request for a quote, you may contact us on 02 8858 0900 today.